Foreign films continued to wallop domestic ones at China’s box office last week, taking a 77 percent share of total revenue for the week ended February 25th. Led by Hollywood holdover Journey 2: The Mysterious Island with $10.5 million, foreigners made off with $27 million of the total $36 million weekly pie, and Taiwanese co-pro Love took another hefty slice with $5 million, leaving only $4.8 million in crumbs for the three currently released films made wholly by local Chinese producers. Thank to the strongly performing foreign films and co-pros, aggregate weekly box office was up a stellar 68 percent over the same week last year. Chinese audiences have been mostly staying away from local product. The average new domestic live action film has grossed barely $2 million in Chinese ticket sales in 2012, whereas the average foreign made film has averaged better than $13 million. Although precious few Hollywood films are allowed into theaters, those that do get released continue to dominate the field. The four US titles released in 2012 have earned $173 million, for a 43 percent box office share. The 18 new Chinese releases combined have collectively earned well under half the amount that one U.S. film, Mission Impossible 4, has generated all by itself. When working with overseas Chinese co-production partners from the island territories of Hong Kong and Taiwan, Chinese producers tend to fare much better than they do on their own. Hong Kong/China and Taiwan/China co-productions have taken in $139 million so far this year, for a 34 percent box office share. It seems that non-mainland Chinese writers, directors and producers have a much better ability to attract Chinese audiences than do their mainland brethren. The big story so far this year is Taiwan’s emergence as a player on the mainland scene. In just the first 8 weeks of 2012, three films by Taiwanese directors have each grossed $8 million or better, and have collectively grossed almost $40 million. 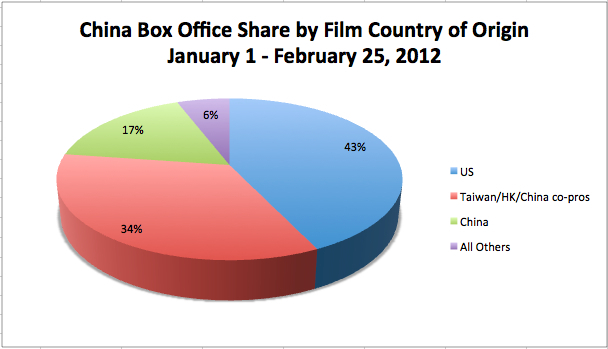 Compare this with last year’s tally of barely $7 million for the 4 made-in-Taiwan films to hit Chinese theaters. With a population barely one percent the size of China’s, and with huge traditional barriers to their acceptance in the mainland (I remember being warned not so many years ago not to bring my Taiwan-printed Chinese dictionary to the mainland for fear that I would be arrested on contraband charges), Taiwan has captured 10 percent of the Chinese box office. All of this begs the question: Why can’t mainland Chinese filmmakers create movies that anyone wants to see? We’ll explore this question in an upcoming article. 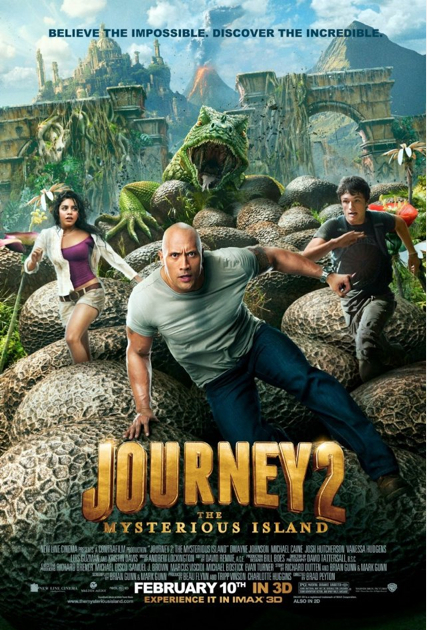 This entry was posted in Analysis, Box Office Reports and tagged "I do, China box office, Happy Feet Two, Hong Kong China co-production, Journey 2: The Mysterious Island, Mission Impossible 4 China, Rob Cain, Robert Cain, Taiwan China co-production by chinafilmbiz. Bookmark the permalink.